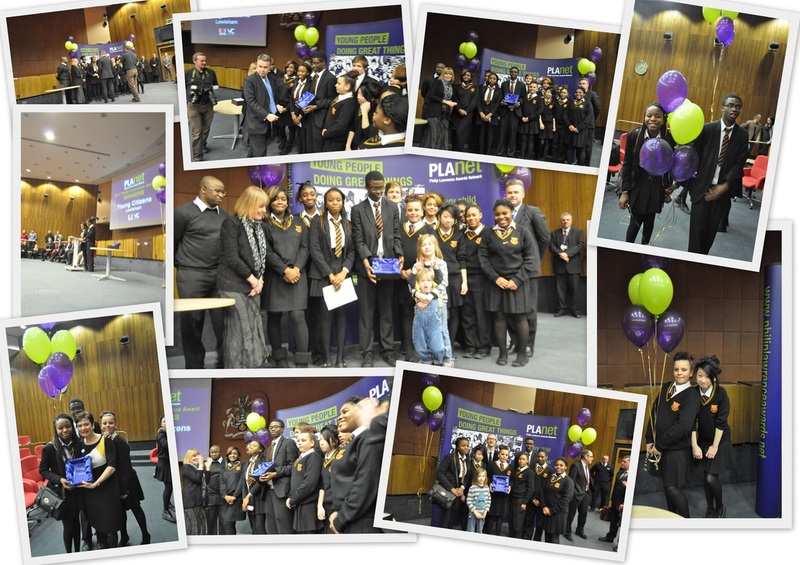 The Young Citizens of Prendergast Ladywell fields College have won the Philip Lawrence Award for their community work. The Philip Lawrence Awards were set up in memory of head teacher Philip Lawrence who was murdered outside his school in 1995 after going to the aid of a pupil who was being attacked by a gang. The awards highlight the work of young people who are doing extraordinary things for their communities: leading the way, crossing divides, building bridges between young people and adults, and making their communities stronger and safer. The Philip Lawrence Awards are organised and managed by Nacro, the crime reduction charity on behalf of the Home Office, and supported by theDepartment for Education. THE YOUNG CITIZENS OF PRENDERGAST LADYWELL FIELDS COLLEGE. The Young Citizens project finds ways to allow young people in primary and secondary schools to express their hopes and fears, meet with people in the community who can help them, and work with these individuals and organisations to improve the community and the lives of those within it. A primary focus of the Young Citizens is community safety. The Young Citizens project has brought together children, businesses, Councillors, Local Council Officials, Mayors, MP’s, Lewisham MET, churches, temples, mosques and community groups. Together they have developed six very active campaigns, bringing community led change to Lewisham. The Young Citizens are most proud of the work they have done to help The Jimmy Mizen Foundation and London Citizens introduce the City Safe Haven campaign to Lewisham, London and Liverpool. "If you had told me two years ago that we would win a national award I would not have believed you. We established the Young Citizens Project because we wanted to become more involved in our community, we wanted to challenge peoples' views of young people and let people hear our positive voices. It has been a hard couple of years, early mornings and late nights, successes and disappointments. Slowly though, we have seen our community come together to help and support us, we have found our place and voice. Our local police are now our friends, our local council and politicians listen and support our campaigns. We and our college have become a living part of our community, active citizens with a voice, we are a positive and proud force for change." "This year's Awards celebrate young people who have taken it upon themselves to deal with really cutting edge issues. They are trying to find solutions to youth unemployment and to raise awareness of domestic violence, learning difficulties and mental health problems. In the aftermath of the summer riots, they are challenging stereotypes which all too often cast young people in a negative light. The passion, modesty and determination of our award winners shine through, as they help to build stronger and safer communities. They are wholly deserving of our thanks, support and admiration. "Frances Lawrence, the Awards’ founder. "Winning this award, having our community, our campaigns and our Young Citizens recognised, is not only a great honour, but it confirms that young people can make a difference, and that together it is possible to change our world. " "It is amazing that we have won this award, that we are one of only six winners in the whole country. We are very proud of everything we have achieved, but most of all we are proud of the work we have done to help introduce the City Safe Haven campaign to Lewisham, London and Liverpool. The Safe Haven Campaign was founded in memory of Jimmy Mizen by London Citizens and the Jimmy Mizen foundation. I hope that winning a national award will enable us to tell more people about this campaign, and its message of forgiveness and community. More than anything this campaign has brought our community together." "I am over the moon and lost for words, but if I had to have one word for how I feel it would be PROUD!" Mrs Whitfield, Headteacher of Prendergast Ladywellfields College. "We would like to thank the Philip Lawrence Network, London Citizens, The Jimmy Mizen Foundation, Cllrs Morrison and Addison, Lewisham Mayor Sir Steve Bullock and the Young Mayors' team, Heidi Alexander MP, Sgt Hawtin, PC Ramsay, PCSO Shrubshall, Lewisham Met, Father Bates of St Hildas and everyone from our community." Simon Jones, Teacher of Prendergast Ladywellfields College. City Safe is a campaign organised by charitable alliance CITIZENS UK and LONDON CITIZENS. It grew out of the loss of twelve young lives across London and is dedicated to Jimmy Mizen. Launched at the O2 in 2009 in front of 2,500 young citizens it has established over 250 Safe Havens across the capital, including Lewisham Town Hall and City Hall.